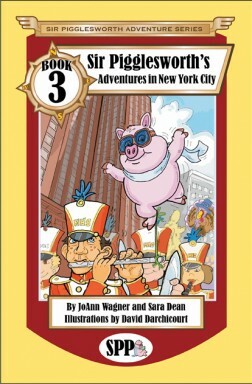 Today we are interviewing JoAnn Wagner, co-author of the children's book "Sir Pigglesworth's Adventures in New York City." I’ve always been a voracious reader, but had never given a thought to being a writer. So I’m amazed to find myself where I’m at today! For 30 years I worked in the medical field in various administrative positions. After seeing the reaction people had to my little stress ball pig that I took with me everywhere I went, who I named Mr. Pigglesworth (the name just popped into my head, I thought it was cute), the idea just came to me one day that it would make an interesting book for children. I renamed him Sir Pigglesworth and the ideas just took off. The book grew into a series as more ideas came into my head. I fast-tracked my retirement so I could spend my time writing and doing readings of my book to schools, churches, day cares, etc. I love my new life!! Describe the plot of “Sir Pigglesworth’s Adventures in New York City” in a few sentences. The City that Never Sleeps is in for a rude awakening! Sir Pigglesworth has hit the streets of New York City with his friend JoAnn, continuing the search for his parents that leads him from London to Dallas, through Vancouver and into the Big Apple. He hits all the exciting tourist spots, learning about the culture of the city from each place he visits. He gets into mischief sometimes as he’s not always good about following the rules. He meets lots of friends along the way. His search for his parents ends in NYC, leading to a heartwarming family reunion. Children ages 5-10…and parents, grandparents, aunt and uncles of all ages!! For readers unfamiliar with the series, can you tell us a bit about Sir Pigglesworth? Spencer Pigglesworth is a lovable royal piglet who was dubbed “Sir Pigglesworth” by the Queen of England and has been commissioned to be an emissary to children around the world. He visits cities across the globe and learns about their culture and language, which he shares with our readers. He is very mischievous and gets into lighthearted trouble but always has fun whatever he does. He is very polite and well-mannered, and teaches kids about proper etiquette. What inspired you to bring Sir Pigglesworth to the Big Apple? I am a native New Yorker and wanted to highlight my hometown. With all the attractions in New York City, I believed it was a perfect place for him to learn about American culture and have fun in so many exciting places. In “Sir Pigglesworth’s Adventures in New York City,” Sir Pigglesworth visits a lot of iconic places in NYC, from FAO Schwarz to Radio City Music Hall. How did you decide the places that Pigglesworth visits? As a child, I went to all of those places and will always carry those memories in my heart. I already knew some of the history of NYC. I wanted my piglet to experience all the fun times I had as a child and in turn share them with the rest of the world. There’s so much history for him to teach other children about this great city. For people who are just now learning about the series, should they start at book 1? Or can they read the books out of sequence? The books can be read out of sequence, but there is a storyline to books 1, 2 and 3 so it’s probably best to read them in order starting with book 1. Subsequent books starting with Book 4 will be stand-alone stories with some recurring characters. Can you tell us a bit about the creative process for this book, from initial idea to finished manuscript? The first idea to come is where he will visit. Once that’s established, I spend a while doing research online so I can learn what he can do, where he can go to learn about the history of the city, and what fun things there are for kids to experience there. Next I do a storyline, outlining the flow of the book, where he will visit first, etc. The book is then “fleshed out” by my co-author . After several editings, it is polished, and read by several people to make sure it is grammatically correct and all spelling is correct. Then off to the printers! Does having two authors make the process easier because you can share the work? Or does it make it a bit trickier because you have to get on the same page as the other person? Actually, it makes the process easier because we bounce ideas off each other. We are usually on the same page, but if I want to change things up, it’s not an issue…I just do it! I always keep sight of my original vision for Sir Pigglesworth, and as the creator of the series, I have final say in how I want my books to flow, but am always open to suggestions. Can you tell us how you got involved with the book’s illustrator, David Darchicourt? I had a vision about the style of illustrations I wanted for my books. I logged into eLance.com and contracted several illustrators who did a great job but still couldn’t draw my vision. So I continued the search for an illustrator on the site and saw some work that David had done previously. One book he had illustrated in particular caught my eye. It was very close to my vision. I contacted him through the site and we talked on the phone the same day. I told him which illustration of his caught my attention and just asked that he tweak it a bit to make my piglet come to life. He did…and the rest is history. What did you hope to accomplish with the illustrations? I hoped that the illustrations would bring my story to life and that they would capture the imagination of all children. Mission accomplished! If you looked at the illustrations and couldn’t read, you would still get an idea of what the book was about. I don’t have a specific number in mind, but I plan to publish 4 books a year. Since they follow Sir Pigglesworth around the world, there are infinite places he can go to create mischief, teach kids about the culture of that country, and spread goodwill and cheer. My books are very engaging and cause conversations to start with parents about the cities he visits. I want to develop their curiosity and instill a lifelong love of reading and learning. I want all children reading my books to be swept away by their imagination, and to realize that their imagination has no limit! To help with further learning, I believe my books have met my goals.